Wow, I didn’t realise it was coming up for a month since I last posted. I’ve been a busy girl as you will tell from the posts I put up over the next few weeks. I’ve had a full on push with my studies as I am away for two weeks of the month in November. I need to be ahead so I don’t spend the holiday worrying about how far behind I am. My second major project up until now has been finishing a scrapbook for a holiday I went on eight years ago – more about that in the next post. But I have found some time for making things and these are the Black Forest Cupcakes I made for the head nurse’s baby shower. What is there not to like about chocolate, cherries and cream? I can’t find a reason. Because I had to take these to work, real whipped cream wouldn’t work (no time to pipe fresh and if I had piped at home in the morning they would of had to go in the fridge which is tiny) so I cheated and used a can of whippy cream – it did the job but no where as nice as real cream so please use real cream if you can! Makes 12 cupcakes. Preheat the oven to 160C if fan. Line a 12-hole muffin tray with paper cases. Beat the butter and sugar together until light and fluffy. Break in the eggs then sift over the flour, baking powder and cocoa powder, mix well. Fold in the melted chocolate and the milk. Spoon or pipe into the cases and bake for 18-20 minutes until well risen, springy and a skewer comes out clean. Leave to cool in the tin for 10-15 minutes then take out the tin to cool completely. At this stage you can drizzle the cakes with some kirsh (could be from the jar if you treated yourself to cherries in liqueur) or a simple sugar syrup made with sugar and the liquid from the tin of cherries. Once the cakes are completely cool, cut a well in the centre of them (using a cupcake holer if you have one) and fill this well with sour cherry jam; replace a plug of cake in the well to seal. 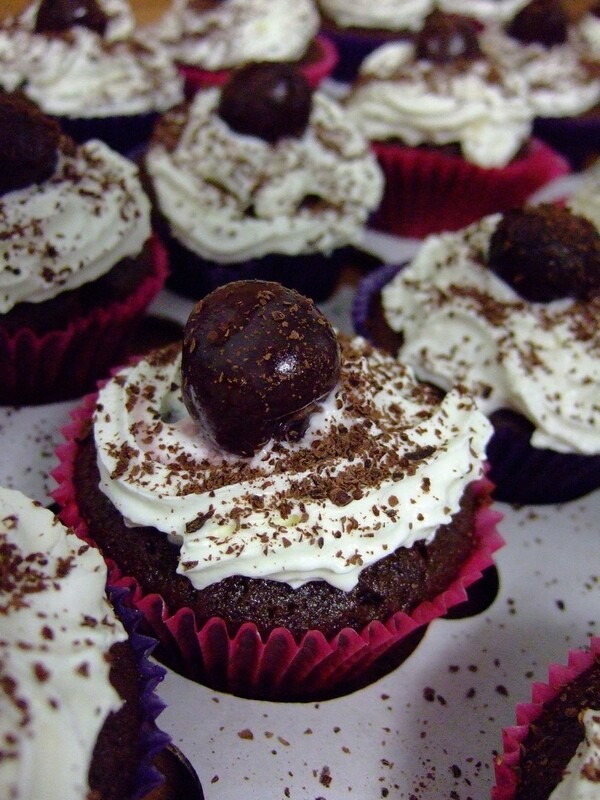 Pipe or spoon over the whipped cream, place a cherry on the top of each cupcake and sprinkle over the reserved grated chocolate.